It’s no surprise that the paths of the virtual Yankees and real-life Yankees have been pretty different. Whether it’s individual players’ performances, opponent’s records, or injuries, this was to be expected. After all, OOTP is a game, and there’s a bunch of randomness that goes into it despite it being calibrated to mimic reality. One thing that I do have total control over is the virtual Yankees’ roster construction, and one big difference compared to reality that I’ve had a say over is the handling of Gleyber Torres. Unlike real life, Torres still hasn’t ascended to the majors. That finally changes in this week’s edition. If you missed last week, catch up here. You know what Interleague play in a National League ballpark means: American League pitchers getting a rare chance to hit. One guy who embraces those changes to step into the batters’ box is CC Sabathia, who got the nod in the series opener in the city of brotherly love. The Phils are a solid team in this universe, entering the matchup in second place in the NL East at 41-36. Unfortunately, Sabathia’s offensive performance in game one was basically representative of his teammates’. The big lefty went hitless in two at-bats against Jared Eickhoff while the rest of the New York offense mustered one run on seven hits, none for extra bases. Indeed, Eickhoff was dominant and the Phillies bullpen too. Sabathia pitched well, allowing two runs in six frames, but without any run support, the virtual Yanks fell 2-1. The middle game featured more good pitching from the Yankees with a side of sufficient offense, unlike the first game. Jordan Montgomery allowed just one run before exiting with two outs in the seventh inning. The bats staked him to a 3-1 lead, which Chad Green came on to protect. Green had no problem doing just that, finishing the frame and pitching a clean eighth inning. The Yankees tacked on an insurance run in the top of the ninth and Aroldis Chapman notched his 18th save. The rubber game was a blowout win for the Bombers as the bats woke up against the Phillies’ bullpen. Once Aaron Nola exited after five innings of mediocre work (three runs allowed), the Yankees’ offense went to work. They plated six runs in the seventh and two more in the eighth, giving them a commanding 11-3 lead which would also be the final score. 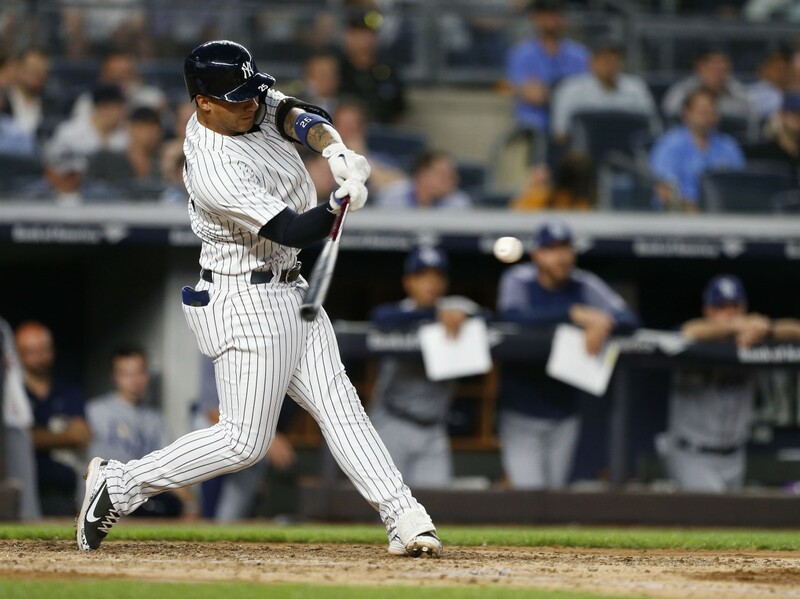 The big blow was Gary Sanchez’s league-leading 27th homer. Sonny Gray delivered the minimum definition of a quality start to earn the victory. Following a day off, the Yankees welcomed the third place 41-40 Red Sox to the virtual Bronx. Entering the series, the Yankees had a four and a half game advantage over Boston (while holding a three-game lead over Tampa Bay). Perhaps more exciting than revisiting rivalry is the arrival of Gleyber day a couple of months later than in reality. With Neil Walker struggling mightily in June (.483 OPS) and Gleyber Torres heating up after an atrocious start to the year, there wasn’t much reason to continue waiting. Tyler Austin was sent down. Luis Severino started game one against Eduardo Rodriguez. The Yankees struck first thanks to Gary Sanchez’s RBI single in the first inning, but Sevy and Rodriguez traded zeroes until the fifth. That’s when the Yankees took command. Giancarlo Stanton came to the plate with two runners on and drilled a three-run blast to make it 4-0 and knock Rodriguez out of the game. Severino gave back two of those runs in the sixth on a Rafael Devers dinger, but the combination of Tommy Kahnle, David Robertson, and Aroldis Chapman in the final three innings held on for a 4-2 win. In game two, Chris Sale was nowhere near as good as he was this past weekend in real life. The Yankees knocked him out with two outs in the sixth inning after Didi Gregorius swatted a game-tying solo homer to make it 3-3. With the Sox bullpen coming in, the Yankees’ chances looked good. Yet, Masahiro Tanaka’s difficulty with the long ball came back to bite him. He allowed four hits in this game, and all of them were solo shots. The difference was Mitch Moreland’s solo dinger to make it 4-3. From there, Joe Kelly and Craig Kimbrel shut the door to even the series. The deciding game did not go well. CC Sabathia struggled and David Price dominated en route to Boston’s 8-1 win. Sabathia gave up four runs through five innings, which was more than enough for the Red Sox. Price cruised through seven and a third, allowing a single run due to a Didi Gregorius homer. 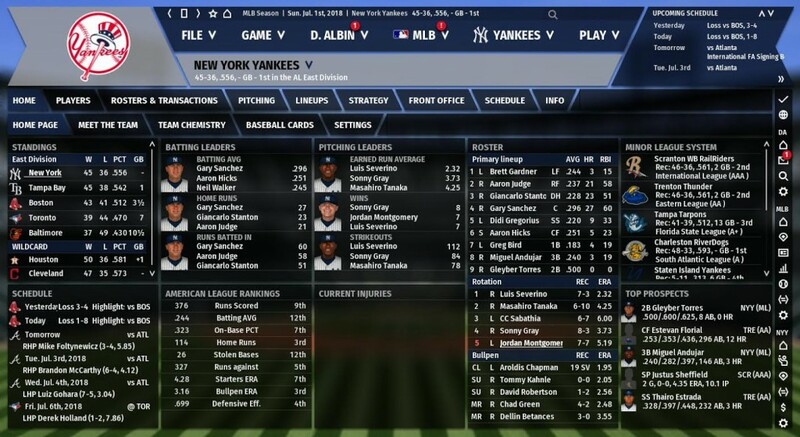 Like last week, these OOTP Yankees had another .500 week, going 3-3. On the plus side, Gleyber Torres had a nice series to start his career going four for eight with a double and two walks. Another week, another .500 performance. Still good enough to keep the virtual Yanks in first place, but it was disappointing considering that they took two of three to open the week in Philadelphia and then won the opener against Boston. In the final two games of the week, the Red Sox won with their two best starters on the mound: Chris Sale and David Price. That may not come as a total surprise, but Sale actually struggled in his start and couldn’t finish six innings while leaving with the game tied. Price, on the other hand, was locked in to give the Red Sox the series win in the Bronx. One exciting note is that Gleyber Torres finally got the call to the big leagues and didn’t disappoint, getting on base in six of ten plate appearances in the Red Sox series.